Paul Buchheit, the ex-Googler who created Gmail, remembers how difficult was to convince people that Gmail has the potential to become successful. Once we launched, the response was surprisingly positive, except from the people who hated it for a variety of reasons. Nevertheless, it was frequently described as "niche", and "not used by real people outside of silicon valley". Financial Times reports that Gmail has about 100 million users and the growth rate is still significant: "[Gmail] has been gaining ground in the US over the past year, with users growing by more than 40 per cent, compared to 2 per cent for Yahoo and a 7 per cent fall in users of Microsoft's webmail." Even though the competing mail services improved their offerings and storage is no longer an important differentiator, Gmail still offers an unmatched user experience. After using Gmail, you'll no longer understand why Yahoo Mail places the "Send button" above the message, why Yahoo Mail thinks it's more important to show news and weather information instead of your inbox, why Yahoo Mail still charges for features that are available for free in Gmail, why Hotmail shows a large banner at the top of the page or why you can't auto-forward mail to a non-Hotmail account. Gmail made so many right choices that it's easy to ignore some of its quirks, downtimes or bugs. As David Pogue said back in 2004, "Even in its current, early state, available only to a few thousand testers, Gmail appears destined to become one of the most useful Internet services since Google itself. Gmail is infinitely cleaner, faster, more useful, more efficient, less commercial and less limiting than other Web-based e-mail services." The perception about Gmail changed a lot over the years, even though Gmail didn't remove controversial features like contextual ads or conversations. From the paranoid "Google reads your mail" or the cool factor of having a Gmail invite, Gmail became successful by continuing to improve and to exceed people's expectations. I think part of it was that it was immediately cross-platform. I didn't have to wait for Google to finally throw a bone to the non-Windows users - I could use Gmail anywhere. All Google needs is one shot at people going beyond their comfort zone and giving Gmail a try and then they are hooked for good reasons. Granted Yahoo & Hotmail have improved but Gmail is just a better designed webmail from the ground up and I think Google has been adding more bells and whistles to it than Yahoo or Hotmail have to their services. Yahoo and Hotmail have improved in some ways, but their new interfaces seem very clumsy to me. Especially Hotmail. Gmail is still far superior. Gmail saved my internet life. I used to have 3-4 email accounts, not satisfied by anyone. Since Gmail, I have kept a single email account for 5 years and counting. That's a first for me. And no matter how many messages I get, I can organize them however I want with filters, search and labels. Plus, POP, forwarding and all sorts of goods. Ads are a way for Google to pay their bills, if you don't like ads, buy an e-mail for yourself duh..
Yahoo! is very cluttered and has less features for more ads. Hotmail is badly designed and offers stuff for the casual user that doesn't even look at their e-mail. 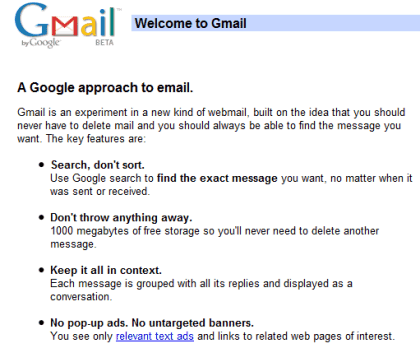 Gmail is for the power user who is going to use POP, Labs, IMAP etc and still is fun and friendly. I can't wait for Google to do something magical with GrandCentral and Gmail - we shall see. Gmail is a good service, but it's amusing to see fanboys raving endlessly about how "superior" it is and making excuses for its glaring deficiencies. No drag-and-drop, no sorting, no way to turn off "conversation" mode, bizarre IMAP implementation, no way to block addresses (sorry, fanboys, but "filter to trash" isn't the same thing), .exe attachments aren't allowed, "custom from" doesn't work properly, etc. etc. etc. I can access GMAIL at work b/c I can use an HTTPS connection to sign in. In addition to that, I can use Google Talk for the same reason. FTW! I could add many other things to your list of issues (no way to search inside attachments, no option to remove attachments from a message, no filters for sent messages, no option to undo sending email, poor contact search), but nobody said that Gmail is perfect. I think that having threads and not being able to disable them is better than not having threads at all. The IMAP implementation is not very good, but you must remember that Yahoo Mail and Hotmail don't offer IMAP, or at least not for all clients. Sorting could be useful, but I don't think it's a significant feature since Gmail groups the messages from a conversation. Gmail has kept me at one email account for year. I use varous adblockers for normal surfing, but when I log into hotmail without I am horrified! Gmail has it's share of bugs, but it's still offically in beta (according to the logo). I would pay for Grandcentral in my Gmail, but might expect not to have the ads too. I keep suggesting people switch to Gmail, and have completely taken people from outlook express to Gmail with the year. I keep telling some to change, like my father who complains about having to delete items from his 200MB inbox, while I never delete anything but the well sorted spam each week, and can still only reach 20% space used! I use another email service as my primary email address, and use GMail for non-work related stuff and subscribe to various mailing lists. This approach allows me to separate business with personal interests. The Ads feature, interestingly enough, is an added bonus whenever I read emails from the mailing lists. I found things that I otherwise might not find. Love Gmail, but when are they going to take it out of beta? I think it is a running joke now at Google to never take it out of beta :). To me linking all services to one single account, make wonders! The spam blocker works magically. I have two GMail accounts, one for personal use and another for lesser-known commerce sites and such -- I'd say 95% of the spam is handled correctly, with rare cases of non-spam handled incorrectly. GMail's application for BlackBerry and web access for mobile phones are also pretty awesome -- I can access personal e-mails and contact information in a separate environment from my work e-mails on the same handheld, and can search through the entire archive of personal e-mails, which can be useful in a pinch! I think GMail is great, and by extension Google Apps for your Domain is awesome. I've now helped a number of friends and relatives setup their own domain too. Initially my intention was to use POP until IMAP came along. But I started using the web interface, and now only rarely use IMAP. The integration of Docs, Calendar is a bonus and I use these frequently. I only wish there were more things (like Picasa Web Albums) which were integrated properly - and you didn't need a separate Google Account. I think filters work on sent mail, if you use the "subject" criterion. I noticed that on several occasions. The ability to remove attachments from a message would be great. Now I delete the message altogether, or I use Thunderbird to copy it locally, remove the attachments there, and then copy it back to Gmail through IMAP. Thanks Paul, for creating Gmail! My colleagues and I can't go without it. ... Gmail is excelent. However, I would appreciate not having to set the font each time. Right on Alex - once you start using Gmail, it's hard to go back to anything, or understand why people use Yahoo. Among my wishes for it: HTML in signatures, ability to set default fonts for rich text emails, fix the damn double line spaces between paragraphs (Outlook sends them as a single line, Gmail shows them as double-lines). If only they wouldn't keep breaking it in Opera. I use Opera because it's fast and secure (like Gmail) but Google keep mucking about with the code and breaking it. I love Gmail. I use it in conjunction with GMX - I use GMX as a 'rerouter' for diverting my hotmail and yahoo mail to gmail. Thus, Gmail is my mail hub (with props to GMX). I have only one qualm with it - it doesn't have the facility to embed, at the very least, an image into your signature. I have a workaround for that too... Webstamp for Firefox. But still, it's about time Labs did something about that! I absolultey adore gmail! its the best thing ever!!! I tried out all the other email users, and I didn't just find them very good, I was about to give up but my friend suggested to me Gmail and I tried it out- its amazing- its so easy to use and I love the chat and video chat feature, and it keeps me intouch with my friends. Google goes "Evil". I did love Gmail, I'm leaving.